Most of the supplies I used for this project are linked in the link-up tool at the bottom of this post. I went for a scene and used the Grassy Edges to ground the card. I sponged the panel with Distress inks using jumbo daubers. I matted the panel on Milk Chocolate cardstock. 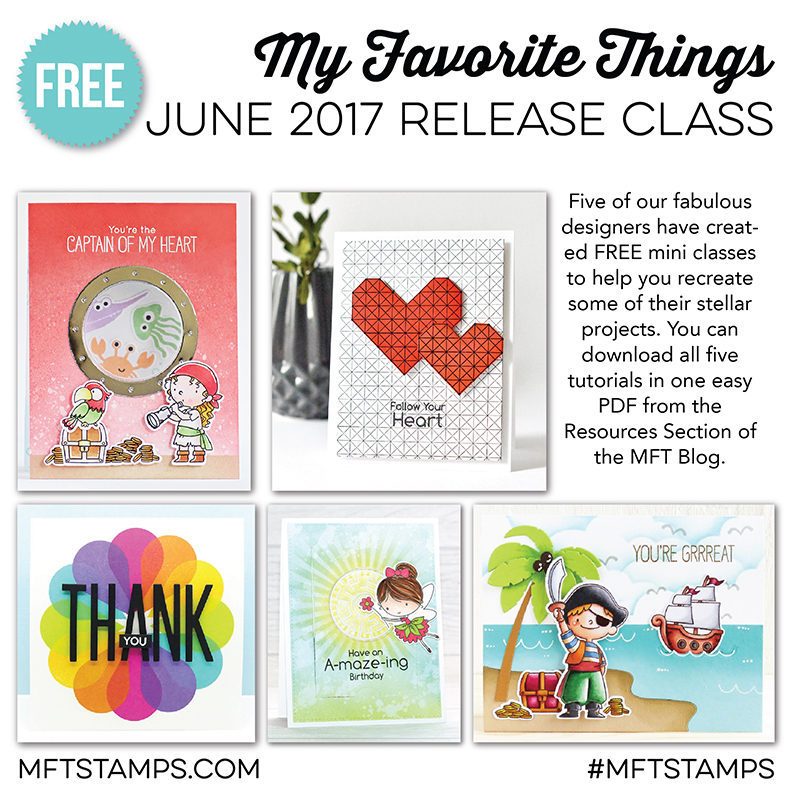 Don’t forget to check out the MFT June 2017 PDF release class where you can find a lot of inspiration and step-by-steps. I made a tutorial too using a lot of inks and cardstock to create beautiful rainbow effects. What a cute leopard card! The leopard set was a must for me, they are super cute! I don't mean to repeat myself, but you really know how to bring all these adorable images to life with your beautiful coloring, Francine! Such a sweet scene and your blended background is flawless...LOVE this darling card!!! This leopard is very cute and adorable. Love the blended background. Cute leopard and love the colorful background. Love this beautiful background eitgh the leopard! Adorable card! I love your coloring of the leopard, and he pops off that beautiful background. Really nice card! The background is awesome! Adorable card! Love that cute leopard and your awesome coloring! Adorable card. The background colors are beautiful. So cute! I love the background! such a cute card: your coloring is perfection!! Great card! The leopard is awesome and that background...wow it looks stunning on this card! I've a crush for the leonards. Beautiful card! Love how you've colored him. Oh wow! What a gorgeous background and I love the way you coloured the leopard too! This leopard is so cute! Adorable! I'm totally loving this leopard! The card is super adorable but that background is simply gorgeous! The sunset background is blended to perfection! LOvely card. Love the contrast in your colouring! Adorable card!!! This little leopard is just so cute!! And I love the distress background you did. Awww!!!! It’s absolutely cute!!! Beautiful colors!!! Oh love your little cute leopard. It is so great colored. Cute card! I love that little leopard! Adorable card. Love the cute image. Love the orange and yellow sky!! Great card! Your card is incredible. The leopard is beautiful against the stunning background colors. Love it!! the background is amazing! such great blending! i love it! Wow! Stunning card! Wow! Love it! awesome sky for this cute image. How adorable! Your coloring is beautiful and I love the background you created. Thank you for the chance to win! What a cutie of a card. I love how you colour your stamped images...very inspirational. Love this card!! You're the queen of blending!! Very nice scene!Love the colors of the sky! Wow! Nice in every way! Such a striking use of color. Really makes the adorable leopard stand out. That leopard is darling and I love your gorgeous sky! Fabulous card!!!! The color just pops! This is one of my two must-have sets from this month's release! I think it is so unique and your card featuring the leopard is fantastic! You have some amazing Copic skills. Such a joy to see your work. Cute card! Your coloring is awesome and ink blending is spot on! The colors of this card are fantastic! I love the darling leopard against that beautiful sunset. He is just the cutest leopard! Beautiful colors! 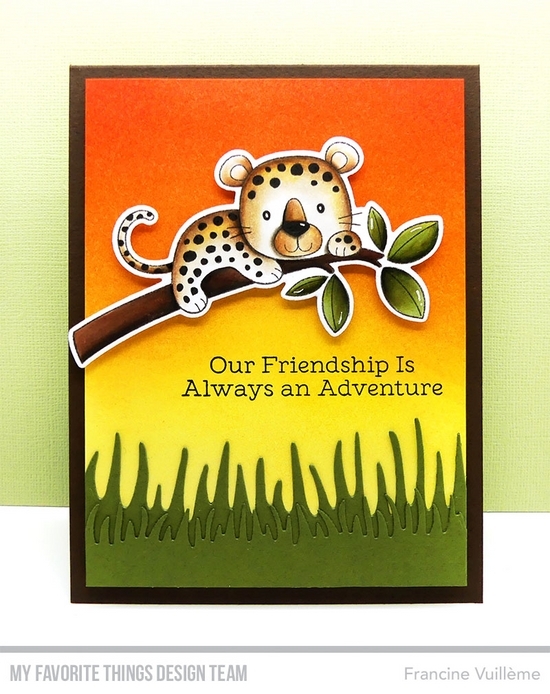 This leopard is so cute, love your card! I'm not lion - that's a cute card. The background on this card is amazing! The background is perfection. The coloring on the leopard is just beyond. I love how leaving portions white gives it such character! LOVE the background and the dimension the grass makes! And your leopard is just adorable!